Larry Fessenden is a Horror fan’s Horror god. A humble speaker that is honest about his desire to scare people with his work just as much as he wants to enjoy the scares with them. Fessenden is an actor, directors, writer, producer, film editor, and cinematographer that also penned horror comics based on some of the movies he’s been involved in (namely Wendigo and The Last Winter). Fessenden heads an independent film studio based in New York City called Glass Eye Pix, which has been creating “fierce independent media” since 1985. Amongst the studio’s most sought after films we find Habit (considered by many to be one of the best vampire movies ever made), Wendigo, Satan Hates You, The Last Winter, and Stake Land. New York Comic Con 2018 wasn’t Glass Eye Pix’s first rodeo at the convention. 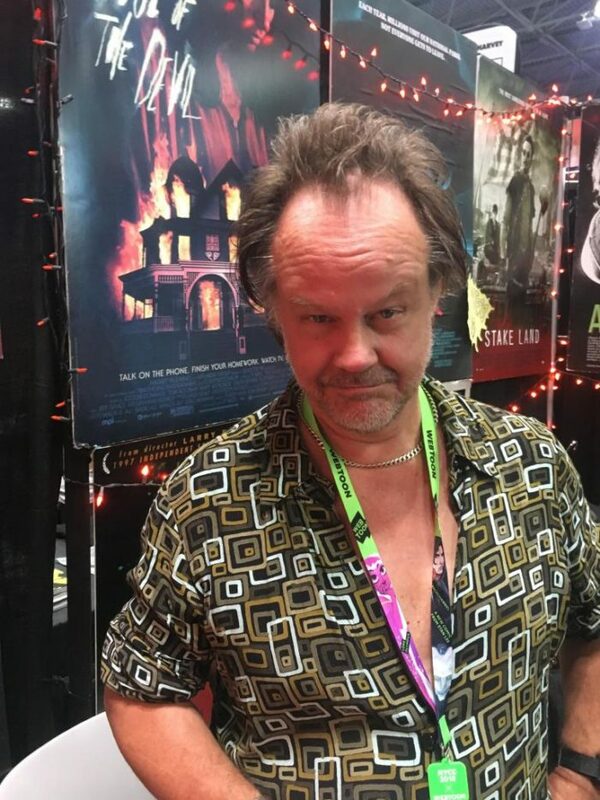 I had the opportunity to chat with Fessenden about staking a claim for Horror in the convention, bringing hard-to-find Horror movies back to the market, and whether his studios will be digging a bit more into Horror comics as it continues to grow. Ricardo Serrano: Larry Fessenden, creator of everything horror nowadays, especially through your company Glass Eye Pix, which has been around since 1985, correct? Larry Fessenden: That’s right. You know, it’s been a name that I’ve used for my own films and then I built a community of filmmakers and artists, comic book artists, film directors. We do audio plays as well. We have a community of people making original art. Serrano: So, you’re in New York Comic Con, surrounded by lights, sounds, and other booths all vying for your attention, but your out here trying to carve out your own space for a horror both. I think that’s really interesting and important, so, how do you go about doing that? Fessenden: You know, I’ve always liked the idea of branding. The movies that we make have a certain tone to them, they’re often called slow burns, they’re based on character and not just gore but we have a little bit of both. Some of them are political minded, and just the idea of doing original work, more and more, especially, with the big franchises—Marvel and some of the ones I’m fond of, like the giant Godzilla movies—in other words, take your pic from pop culture. What we don’t have is people making smaller films, and so that’s a niche we can provide. Even at Comic Con, where we’re obviously the smallest possible fish, people come here and their eyes brighten and they’re excited to see somebody trying to make original work. We still work with big names, like Ron Perlman or Dominic Monaghan, Angus Grim—rest his soul—and so we’ve intermingled with major celebrities, but we remain very independent. I believe, in this day and age, you have to wave that flag. Serrano: I agree. I did notice you have comic books in your booth, The Last Winter andWendigo, based on some of the best horror films I’ve ever seen. Do you see yourself expanding further into the comics scene? Fessenden: Yeah, I mean, I fantasize about Glass Eye Pix comics as a label. We do call ourselves that. There are more of our comics online as digital, at Comixology. We have a prequel to my film Beneath and other things like that. We always like the idea of a comic book tie-in, it’s very thrilling. We even have—I don’t have them anymore—we made an action figure of the Wendigo and so on. It’s just fun to play like the big boys, even though they’re all home-baked creations. Serrano: You’re featuring the Larry Fessenden Collection on Blu-Ray, which looks amazing. But one interesting thing in it is that you have the movie Habit as well as Wendigo included in it. Can you comment on how hard it is to preserve movies that received limited distribution or limited runs for home release. Movies that were great but didn’t get mass distribution. Fessenden: It’s a great struggle and that’s why I take it personally and also as a cause to preserve the more off-beat movies. Some movies will, unfortunately, fade into the distance if there’s no way to preserve them, if Netflix doesn’t pick it up or something. I also believe in physical media. I love to have the objects on the wall, you know. It’s like buying a book. You could read it on Kindle, but the [physical] book you could look up when you’re looking for inspiration and you’re reminded of another book or a movie that matters to you, so there’s something for the collector. This is a generational thing. The kids today don’t really know about this, except for the exceptions. Anyway, I like physical media and also we have great behind the scenes videos associated with all our work. My collection has all kinds of crazy stuff on how we made the movies. There was a whole generation of filmmakers that grew up on the extras of DVD and Blu-Ray. They literally didn’t have to go to film school because they saw the great artists talking about their work. So, all of that is kind of like the aesthetic that I like to uphold. It’s a little crusty, but I think it’s a—well, look every generation has to stand up for what matters to them and that’s where I stand. That’s the vibe. Serrano: Especially now that we’re seeing the return of cassettes with music. I associate VHS with horror quite a bit, at least in terms of what I saw as a kid and how I saw it. Do you think VHS maybe deserves its own comeback? Fessenden: Only sort of. The difference is that Blu-Ray, actually, is a lovely format, it’s a preserving format. But I would also argue VHS has its charm just like anything that has a patina on it, you know, if you’re a thrift store collector you like the old garment that’s been worn already, the old table that has a couple of chips in it. A lot of this comes down to aesthetics and I do think you have to fight the razzle dazzle, if you will, the golden toilets that certain members of our society are enamored with. You know, there’s a little more to, uh, something that has age to it. So all this is an aesthetic. That’s why people, the very few who like Glass Eye, is because they get that aesthetic and they have a fondness for something that’s lived in and that is very unique and individual. It’s the only way you can fight corporate entertainment is by doing something that has a singular voice that’s original and true to the individual artist. That’s what I support. Serrano: Completely agree. So, what’s next for Glass Eye Pix? Fessenden: My own film, Depraved. It’s a retelling of Frankenstein, speaking of old classics. Of course it puts it in a modern vernacular and, um, not by being gory, but by really examining the psychological shocks of being created in a laboratory and trying to grow up in a real world! So I’m very excited to get that out to the public. We also recently made The Ranger, which is sort of on the other end of the spectrum. Really fun, punk rock versus park rangers. Really energetic and there’s plenty of gore in that and a lot of great music. So you know, we do support a lot of tones and it’s all about if the passion of the director is on screen then I think we’ve succeeded. « Friday Night, World Premiere of Michael Vincent’s ONLY A SWITCH!